Dear fans and friends, here's our new videoclip for "Halvdan The Black" showing a collage of impressions from the tours and festivals we did around the globe filmed in North America, the Caribbeans, Europe, Latin America, Russia and Asia! Take a closer look and you may discover yourself in the audience! Enjoy the video and stay tuned for more news about King Of Kings!" Check out the video for "Halvdan The Black" on KNAC.COM right HERE. 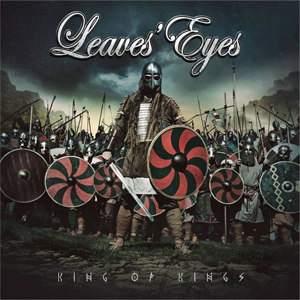 LEAVES' EYES are gearing up for the release of their new album, King Of Kings. They recently shot a video for the song "The Waking Eye" in vocalist Liv Kristine's native Norway. LEAVES' EYES recently signed a new record deal with AFM Records. Jochen Richert (AFM CEO): “When you get the chance to work with such an incredible band, you just have to do it. LEAVES' EYES are one of the leading bands in their genre and we know that Liv and her band are professional in every way. In addition, we know each other for many years and get along so well. So LEAVES' EYES for us is the "total package" and we are delighted and proud to be their new label home." Nils Wasko (AFM Creative Director): "I can only agree here: it's a pleasure to have LEAVES' EYES on board now. Liv is an icon of the gothic- and symphonic metal scene and has led both THEATRE OF TRAGEDY and later LEAVES' EYES to international fame. We are really looking forward to this new collaboration".